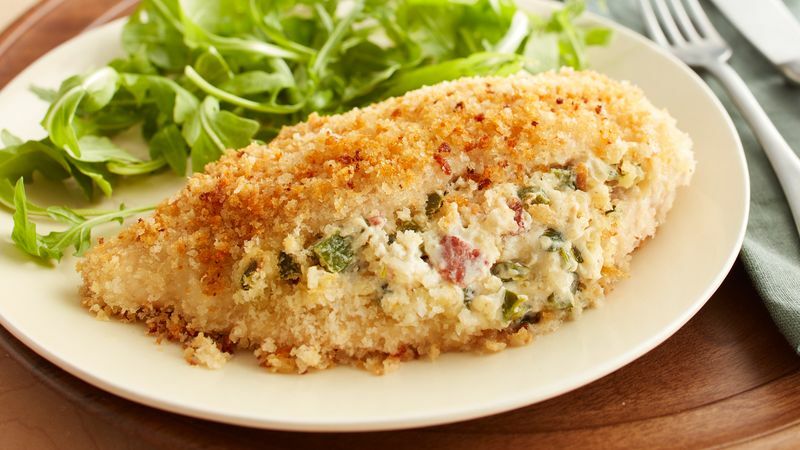 Jalapeño poppers are the inspiration for these addictive, crispy baked chicken breasts. Dovetailing tip: When cooking the bacon, cook 10 slices of bacon. Crumble 2 and save the other strips to add to your Ultimate Grilled Cheese Sandwich for Meal 2. 1 Heat oven to 400°F. Line large rimmed baking pan with cooking parchment paper. 2 In 10-inch skillet, cook bacon over medium heat until crispy. Using slotted spoon, transfer to medium bowl. In same skillet, add onion and poblano chile; cook until softened, about 6 minutes. Transfer to bowl with bacon. Let stand 3 minutes. Add cream cheese, Monterey Jack cheese, 1/4 teaspoon of the salt and 1/4 teaspoon of the pepper; stir to combine. 3 Cut pocket in each chicken breast by making a horizontal slit along thin long edge, being careful to not cut through to opposite side. Stuff each pocket with a quarter of the cream cheese filling (generous 1/4 cup). Press edges of chicken together to seal. 4 Pour melted butter into shallow bowl. In another shallow bowl, place bread crumbs. Season stuffed chicken breasts with remaining 1/4 teaspoon each salt and pepper. Dip chicken into melted butter to coat both sides, then dip into bread crumbs to coat completely. Transfer to pan. Bake 20 to 25 minutes or until chicken is no longer pink in center (at least 165°F).